First and foremost… that floor. We can’t take our eyes off it! Tell us all about it. It’s a white oak Vintage Northern Solid Sawn Wire Brushed Herringbone. It’s a ¾” product measuring 3-1/4''wide and each plank is 14.68''L. The color name is “Zeus,” a really beautiful taupe/grey tone which works really well with the aesthetic of the space. It also has a UV oil finish to protect it over time. I love the effect the light has on it as well – you really see the distinctive rows highlighted throughout. We love this simplicity of this entryway. Do you have any go-to rules when it comes to styling this particular space? I love for the entrance to set the tone for the rest of the space. In this case, we had the ability to reconfigure the main floor layout, providing a place for a sofa with personality that really speaks to our clients. It was originally going to be a built-in bench done in a similar style with a tufted back and storage for shoes below but once we found the sofa, our clients were in love. I also like a clean front entryway whenever possible so in this case we located the closet beside the seating area so we can tuck away the everyday stuff. On to the fireplace: it’s stunning! What role does it play and how did that role affect your design decisions for this element? There was an existing fireplace in the house in that area but it faced the back of the house (old living room which is now the new kitchen). We thought it would be a fantastic feature if we could see it from more than one area of the house so we chose a three-sided fireplace in order for it to be appreciated from the foyer, kitchen, living and dining room. Can you tell us about the island? What features, both functionally and aesthetically, were must haves? The island is the gathering place – the hub of activity in any get together – so it was important to have plenty of counter space. Since we have the sink in the island, we wanted to ensure no splashing onto the floor from the back of the sink. The 36” width keeps it clean. The island houses the dishwasher, cutlery storage and a waste and recycling station. The posts on either end were designed to make it feel more like a piece of furniture since it’s so central to the space. 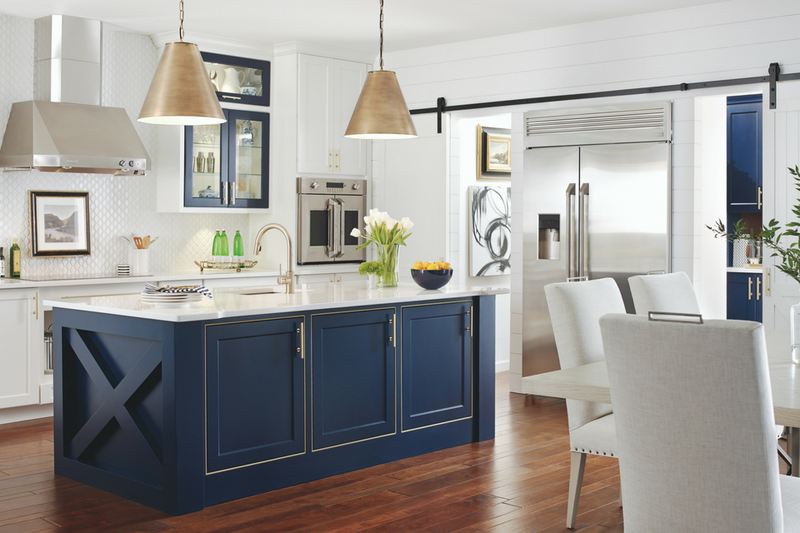 The gold-clad back splash and custom hood are gorgeous. How did you go about selecting these two elements? The style of the hood has been in all of our sketches from day one and I trusted our vision to our friends at Colclo Custom Woodworking. Once we knew we didn’t need much back splash beyond the area behind the stove, we really wanted something special there. I remember sending a photo of the back splash sample to our clients from a design show I was at and they originally thought I was nuts. Needless to say, it grew on them and they now appreciate that whole area as a piece of art in their space. Sometimes it takes a little convincing, but inevitably if our clients jump into the vision with both feet, the results speak for themselves. We notice there are no window treatments. Can you explain your decision to forgo this detail? Our client’s property backs on to a gorgeous ravine. Since they expressed no desire to cover their windows, we chose to highlight the view beyond with black framed windows and white casing. We feel like it connects the interior to the outdoors in a way that highlights the view as art. The adjacent dining room is darling. What was your thought process behind selecting a round dining table as opposed to a traditional rectangular or square style? A round table in the dining room really aided the flow of the space and helped to connect the dining area to both the living room and kitchen. It felt more approachable and less formal than a rectangular table. The chandelier and armoire in that space are pieces that we kept from the original house and just gave them a new coat of paint (courtesy of our friends at Born Again Shabby Chic for the armoire and our clients’ neighbor gave our chandelier some love). Both of these pieces have curved elements in their design, so a round table just made sense. What was the most challenging aspect of designing this space as a whole? It's been a long road from where we started to where we ended up. Our clients originally wanted a quick fix for their bungalow but after noticing that their roof was falling apart, the budget quickly escalated. My trusted pro and friend at Life Home Design worked together with us to come up with our client’s dream home working from the inside out. We raised the roof and eliminated columns between the dining room and new kitchen. When our ceiling height increased, it was important for us to keep that cozy feeling. Adding elements like the wood beams (by Anazao), wall sconces, warm metals, tufted upholstery etc. were crucial to our end-game. 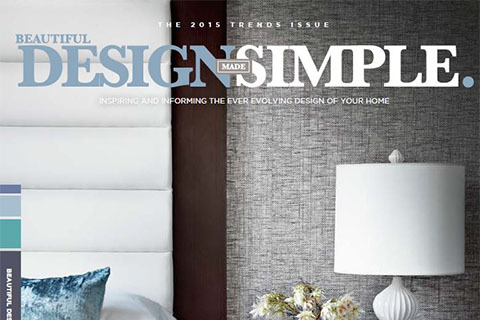 View the 2018 Trends Issue of Beautiful Design Made Simple magazine.